While visiting Amsterdam in spring 2010, we encountered what we were told was an uncharacteristic garbage strike. Our Dutch hosts were most embarrassed by this turn of events as it meant we would not be able to see the city at its finest. Not to worry … this undesirable set of circumstances actually provided a few moments of amusement, including the one captured in this image. While waiting for our canal boat tour to begin we were entertained by these two mystery birds (does anybody know what they are?) who were nest building across the canal. Can you spot them? One in the tire setting up home; the other swimming in the water bringing her the materials? 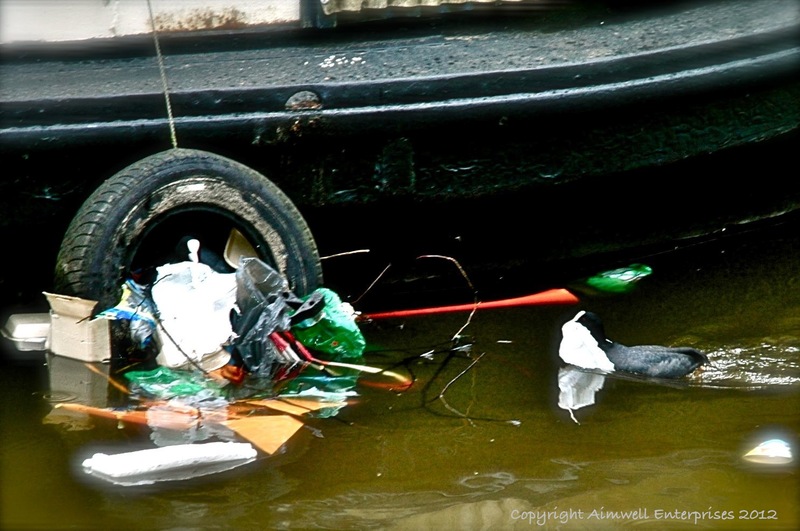 As you can see, this resourceful couple made good use of the refuse they found floating in the water, padding their makeshift nest with all manner of paper and plastic items at their disposal. It was fascinating to watch them interact. To see the male (I’m assuming) fetch a suitable item, such as the white paper bag he’s carrying in this image, and hand it over to the female perched in her new home, setting it up just as she’d like it. If any of the material fell out of place, her partner would retrieve it with his beak and give it to her so she could go about finding another suitable position for it. At least these clever birds had found a creative way to deal with the city’s garbage problem. This entry was posted in Animals, Europe, Holland, Nature, Photography, Travel, Uncategorized and tagged Amsterdam, birds, Holland, Photography, spring, Travel. Bookmark the permalink. That is quite the nest they have going there. Amsterdam is such a beautiful city – hope to go again someday but next time with my camera.